Cold season has definitely hit my house. My two boys and I seem to have had a cold for the last two weeks straight. I am not one of those people that does well sick. I tend to be irritable and a wee bit snappy. It doesn't help that last winter the cold that I had turned into pneumonia and then two trips to the ER and a hospital stay. I think the whole ordeal has me a little paranoid. Add that to the fact that the two times I have intended to get my flu shot this year some sort of mini-issue has prevented it from happening. Luckily I got the pneumonia shot last year and I am determined to get my flu shot before the end of the month. The beginning of cold/flu season always has me thinking of food. Weird I know, but colder weather and feeling under the weather makes me long for soup and comfort food. As I have talked about before this is my favorite time of the year. 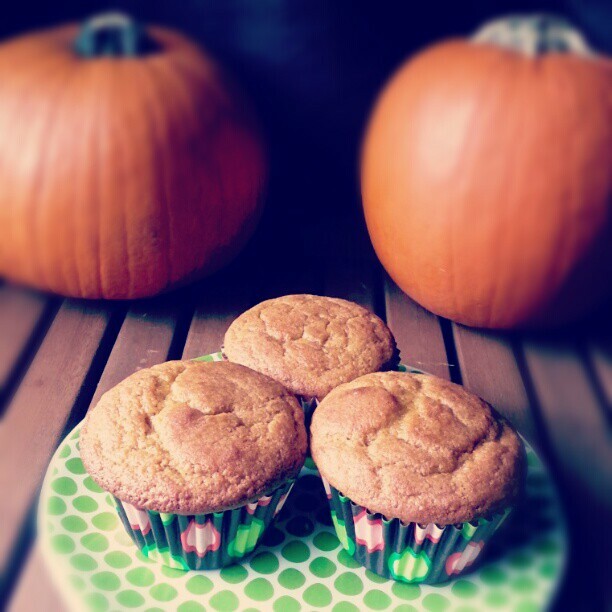 I absolutely love fall flavors, with pumpkin being my number one favorite fall food. However, this is the first year I have been eating completely gluten free, so things have been a little different. The fall back staples in my fall recipe file have had to be modified. Some recipes have worked gluten free really well. Others have been pretty much disasters. Last month I tried a new recipe for Gluten Free Pumpkin Bread from Everyday Food which worked great as both bread and muffins. This recipe has 12 ingredients. It takes 1 1/2 of total time, 15 minutes of which is active and makes 8 servings. I had no problems finding any of the ingredients at my local grocery store. I found a great coconut flour based all-purpose gluten free flour which I love. It makes the best cookies and baked goods and my kids can't tell the difference from regular wheat flour. Make sure to not overly beat the mixture once the pumpkin and buttermilk is added. Overly stirring will cause the bread to not rise properly and have a dense, not fluffy texture. I had to cover the bread with foil approximately a half an hour into baking to prevent over browning. I actually made this recipe twice. The first time as bread and the second time as muffins. For the muffins I made 12 total and baked them for approximately 20-25 minutes at 350 degrees. I used muffins liners since I love how they look and they are so much easier to deal with than trying to get muffins out of a pan. I followed the remainder of the recipe as written. My two boys loved this bread. It doesn't have an overly strong nutmeg/cinnamon flavor. If you are a fan of a strong spice flavor I would recommend adding a small amount of ground cloves to the recipe or even a bit of ginger. I often add ground cloves to my pumpkin bread recipes and it does a great job of adding a little something extra. This recipe worked well as both bread and muffins and we ate the whole bread in less than a day. A great gluten free recipe that I will definitely make again. For the recipe go to Gluten Free Pumpkin Bread. These sound great (and kid tested too!!)! My kids are picky eaters so I'll try this out and hopefully they will like it! Feel better soon! I have picky eaters also, so I understand :) Thanks for the kind words, I'm feeling much better today!